Asyla Alymkulova fights back tears in her home in Kyrgyzstan as she recalls the first time she heard her husband was whisked away to one of the notorious internment camps in neighbouring China’s troubled Xinjiang region. Shairbek Doolotkhan, a Chinese-born Muslim and mining executive, had told his wife everything was fine when he travelled to his company’s office in Xinjiang to deal with “some problems”. But then his phone went dead in October last year. Alymkulova, 33, had no information about what had happened until a few weeks later when a company representative phoned and said her husband had been “sent away to study” in a camp. “I asked her: what is he studying?” recalled Alymkulova. The reply on the other end of the phone left her stunned. The company would “try to get him back” — but there were no guarantees. The “study camp” is believed to be one of the numerous extra-judicial detention centres set up in Xinjiang, holding as many as one million Uighurs and other Muslim minorities, according to estimates cited by a UN panel. 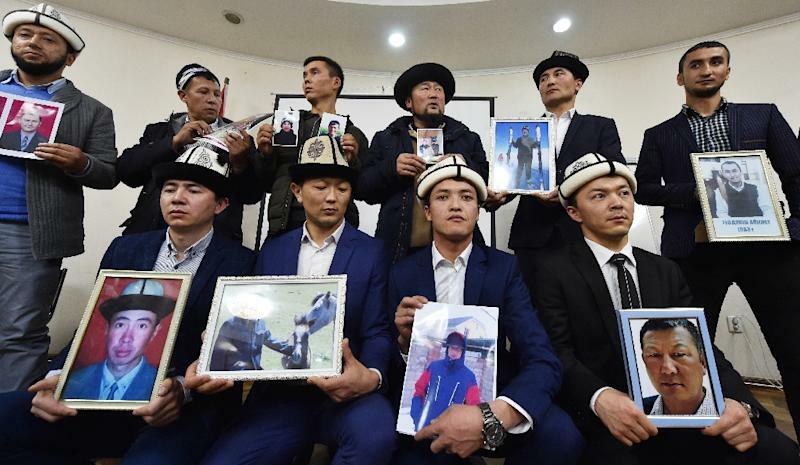 Doolotkhan’s disappearance shows how China’s vast dragnet has extended and now hits people with links to Kyrgyzstan, after similar reports emerged from distressed families in neighbouring Kazakhstan. But human rights activists say members of China’s Muslim minorities are being held involuntarily for transgressions such as wearing long beards and face veils. Rights groups say the region has become a police state. Sitting in her home in Bishkek, the capital of Kyrgyzstan, Alymkulova arranged photos of her husband on the kitchen table. The pair met after he moved to Kyrgyzstan in 2005 and he began working as a translator. The couple had a son and in 2011 her husband became the executive director of a Chinese-run coal mining operation in southern Kyrgyzstan. Then, in late 2016, just after hardline Communist official Chen Quanguo took over as Xinjiang’s regional party boss, her husband was called back to the company’s office in Xinjiang. He told his wife he needed to stay for some time, but continued to phone home regularly. Until one day, over a year ago now, when the calls stopped. “My son is 12 years old. At school people ask him ‘Where has your dad disappeared to? '” Alymkulova said. Chinese policymakers talk of Xinjiang, a northwestern border region home to significant Muslim minorities, as an economic bridge to underdeveloped Central Asia. Beijing sees it as a key hub in its ambitious trillion-dollar “Belt and Road” trade and infrastructure drive. It is mainly home to ethnic Uighurs and other mostly Muslim Turkic minorities. With Uighurs lacking a historic homeland beyond the region, the stories of separation from loved ones told by citizens of neighbouring Kazakhstan and Kyrgyzstan have offered vital insights into the scale of China’s crackdown. The fate of 1.5 million Xinjiang-based Kazakhs has been a hot-button issue in Kazakhstan. In Kyrgyzstan, the plight of members of the smaller Chinese Kyrgyz community only recently emerged after reports that a Kyrgyz lawmaker’s brother had been detained. Family members of those missing have also stepped up awareness campaigns. Committee member Seyitbek Isa Uulu, a 30-year-old Chinese-born Kyrgyz, told AFP he fears at least six of his relatives are being held. “They are ordinary people — shepherds, small-time traders. I can’t believe this has happened to them,” Isa Uulu said. The family members have not been heard from since last year. People from Kyrgyzstan and Kazakhstan, who speak similar languages and share a nomadic heritage, had been generally spared the excessive state targeting that Uighurs had long complained of before Chen’s appointment. The hardliner is viewed as the chief force behind the internment camps, which are the subject of growing international condemnation. Adil Zhunus Uulu, a naturalised Kyrgyz citizen, was the first Chinese-born Kyrgyz to enter the national parliament following elections in 2015. His brother Askar Yunus — a Chinese citizen and historian — is one of several ethnic Kyrgyz academics that have been arrested by Xinjiang authorities this year, Zhunus Uulu’s parliamentary assistant told AFP. A representative of the Xinjiang foreign affairs office said it had no knowledge of Yunus’s arrest. Asked about alleged arrests of Kyrgyz, the Chinese foreign ministry said officials “do not have information”. Kyrgyzstan’s foreign minister declined to comment when asked by AFP if Kyrgyz citizens had also been arrested. While Kazakhstan and Kyrgyzstan have been hesitant to confront China, the United States and Germany have requested UN access to Xinjiang. Beijing previously denied the existence of the re-education camps, but now defends them as “vocational education and training centres” where students study Mandarin, brush up on job skills, and pursue hobbies such as sports and folk dance. An AFP investigation published in October showed authorities had purchased police batons, electric cattle prods, handcuffs, pepper spray, stun guns and razor wire for the centres. Orynbek Koksebek, a Chinese-born Kazakh who received Kazakh citizenship in 2005, was released from a facility in Xinjiang in April, five months after he was arrested during a brief visit to the region. Once interned, he found himself subjected to mundane political education classes along with occasional bouts of humiliation, he told AFP. “They showed me a picture of my father, tore it up and threw it in the bin,” he said. “That was the worst thing for me,” he said, adding that the detention had affected his mental state. Next Next post: U.S. Giving $5 Billion in Aid To Mexico — But $0 For Border Wall!